You can use the Knowledge Capture dashboard to analyze your Knowledge Capture events and ticket activity. For information on the metrics used on the Knowledge Capture Insights dashboard, see Knowledge Capture metrics reference. You must be on Guide Professional or Enterprise and Support Professional or Enterprise to use the Knowledge Capture dashboard. You can view the Knowledge Capture dashboard directly in the Support agent interface. Refer to the sections below for information on the reports available in the dashboard. In Suport, click the Reporting icon ( ) in the sidebar. Ensure Insights - View Only is selected from the drop-down list. Select the Knowledge Capture tab. Note: If you have several different Insights - View Only tabs, you might need to use the left or right arrows (>) to find the Knowledge Capture tab. The Knowledge Capture dashboard displays your most important metrics at the top of the dashboard as headline reports. Headline reports show only one number, so your metrics stand out. The headline reports display results for the current 30 days, and includes the percentage by which the number has increased or decreased from the 30 day period prior. Solved Tickets with Knowledge Capture Activity: The percentage of solved tickets with link, flag, or create activities. Solved Tickets with Link Activity: The percentage of solved tickets with an insert link activity. Solved Tickets with Flag Activity: The percentage of solved tickets with flagged article feedback. Solved Tickets with Create Activity: The percentage of solved tickets with article creation. 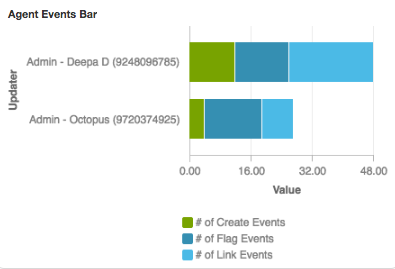 The Knowledge Capture Activity report measures the number of Knowledge Capture create, flag, and link events by week. You can highlight results for one event type by hovering over the event name at the bottom of the report. If you hover over a data point, you can see the event type and exact number of results. If you want to view daily results, you can click a week name to drill in. When you drill in, a new chart will show each day of the week with Knowledge Capture activity. Days with no Knowledge Capture activity will not be shown. You can view the agents with the highest KC activity, including the total number of events and number of create, flag, and link events. Agent activity: The Agent Activity table displays an agent's total number of KC events and activity broken down by event type. By default, agents with the highest total events are listed first. You can change the sort order by hovering over a column header, then clicking the up or down arrow. Agent Events Bar: You can use the Agents Events Bar report to compare activity between agents and measure how results from each event type contribute to the total number of events. You can highlight results for one event type by hovering over the event name at the bottom of the report. On the Knowledge Capture dashboard, you can measure article activity by viewing the articles most frequently used and your top contributors. Top Linked Articles: The Top Linked Articles table displays the articles most frequently linked to. 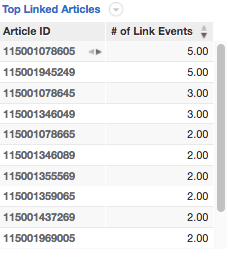 By default, articles with the highest number of times linked are listed first. You can change the sort order by hovering over a column header, then clicking the up or down arrow. Top Article Creators: You can use the Top Article Creators table to view the KC authors that created the most articles. By default, agents with the highest number of created articles are listed first. You can change the sort order by hovering over a column header, then clicking the up or down arrow. Will we have the ability to filter by group? The out of the box Zendesk dashboards are often rendered somewhat useless because they include all tickets, without the ability to filter on groups. Some of our tickets are not support tickets, but tasks (for example). Looks like the metrics are recorded as soon as i hit the insert link button, shouldn't it be recorded after the agent submits the changes? what happens when an agent changes his/her mind and inserts a different KB? ^ I was also wondering if there is a way to track article views? I'd love to see a link to the actual tickets... that way I could go back and see if there were some opportunities to improve self service by looking at the tickets. Love that my team sending the articles out to help customers, but can't help wondering if we can do even better helping them help themselves. We have not yet rolled out the Knowledge Capture app to our agents, but it has been enabled in our system for quite some time unbeknownst to everyone! Insights/Explore are recording Knowledge Capture data on agents, articles, links and engagement...but no one is using it yet. As you mentioned, the reason this data is being tracked currently is because the Knowledge Capture app will track any links added to the ticket manually from an end-user/agent as well as through the app. Unfortunately there's no way to segment this data or toggle off auto-linking at this time. You'd most likely need to disable the app completely until you're agents are ready to use the integration. Thanks for taking the time to share this with us Lila! I'll pass this feedback over to the appropriate team for review. We've been in touch with Zendesk before on this, but putting it here, soo. Our Support department subscribes to KCS methodology when it comes to knowledge management, For the most part, the KC app meets our needs; however, there's a big deficiency in the analytics for knowledge use. It's great to be able to track creation, links, and flags, we're not currently able to track article EDITS. Ensuring that agents are reviewing & editing articles is critical to ensure that our team is engaging with the content in a meaningful way and an important part of keeping our knowledge base healthy. We've noticed, for example, that as our KB has matured, we're creating fewer articles (and link rate is staying very high). This implies that we've got most of the content captured - which is great. But with that change, we're less able to measure ongoing agent engagement through content updates & tweaks (ie. edits). Note that we prefer agents to edit articles on the fly (which keeps KB health in the collective responsibility) rather than Flag - which puts the owness on a few people to own KB content (rather than everyone). We've brought this up as a feature request before, but adding again here as it's a significant pain point - omitting the most critical knowledge KPI for agents from the reporting .